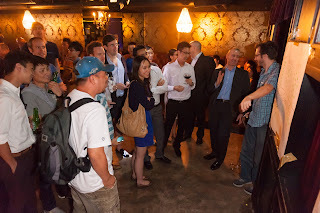 Join us for our 72nd Web Wednesday Social Mixer where we will be interviewing Simon Loong, CEO of Welab, an ambitious start-up looking to "democratise finance". Their first service is "WeLend", Hong Kong's first social lending (or "peer-to-peer" lending) platform. Their lofty goal is to "help people fulfil their dreams". Or in Chinese, "每人都有夢想，不論是學習新的技能、遊歷世界、或開創生意。要夢想成真？我們助你踏出夢想第一步" which translates to "Everyone has dreams, whether it's to learn a new skill, travel the world or start a new business. If you want your dream to come true, we can help you take a step closer to realising it". WeLend sees itself as "a new community for borrowers and lenders to connect through a secure, efficient and professional online platform. Borrowers benefit from more convenient access to capital at lower interest rates whilst lenders enjoy higher interest rates than conventional bank rates". But my favourite and most poignant part of their self-description is, "In our increasingly unequal and isolated community, we believe our business model will create great social benefits. We do this by connecting individuals from all levels of the market to create wealth and by introducing both a social and an altruistic element into the world of personal finance." Chase the dream on their Facebook Page - Facebook.com/yourdreams. After 15 years in banking, with his last post as Regional Head of Northeast Asia at Standard Chartered Bank, Simon is now applying his expertise to bring individual lenders and borrowers together via the internet. He has recruited a team of experts from leading international companies, including Amazon, Oracle, Goldman Sachs, Citibank, HSBC, Bank of Montreal and Hutchison Telecom. Doors open at 6:30pm with the interview starting at 7:15pm on Wednesday 3rd July, 2013 at Bisous, 9/F, LKF Tower, 33 Wyndham Street, Central, Hong Kong. The entrance fee of HK$100 includes a complimentary drink, the chance to network with Hong Kong top's digerati and hear an ambitious start-up share it's dreams. Come prepared with questions to ask the brave founders of WeLend. Let us know you're coming via the event invite page on the Web Wednesday Group on Facebook. Thank you to the brave entr-app-preneurs who took to the stage at Battle of the Apps IV on 19th June, 2013. There was a wide range of apps looking to tap into our desire to find good food, network more efficiently, educate our children and simplify the way we pay for things. Read about the eleven contestants here. 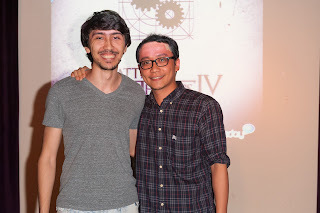 My creative team at Inspire Digital Asia designed this great backdrop to set the tone of the evening, a subtle reference to the highly popular HBO show, Game of Thrones. Each app start-ups had five minutes to present, followed by two minutes of questions. we then opened the vote to our discerning audience of 100 judges who placed their chips or, be more precise, smiley face stickers on their favourite app. The Bronze Award went to GOnnect: a better way to find, make and keep connections. Download from iTunes. Follow on Twitter (@gonnect) and Facebook. The Silver Award went to ZNAP, by MPayMe: a new way to simplify payments. Download from iTunes, Google Play or BlackBerry App World. Follow on Facebook and watch on YouTube. And, the Gold Award went to... Little Rewards: an incentive programme for reluctant children that teaches goal setting and the value of rewards, including money. Download from iTunes. Follow on Twitter (@littlerewards) and Facebook. Congratulations to the three winners! We hope that the rest of the contestants enjoyed the battle, made some good contacts and that Web Wednesday has helped nudge awareness of your creations up a notch or two. Now go make some money! Thank you again to our generous prize sponsors, the Internet Society of Hong Kong - World Developer Summit 2013, Amazon Web Services, Amaze Mobile Media (member of the Gravitas Group) and BlackBerry Hong Kong. Eleven gutsy app enterpreneurs ("entr-app-reneurs") will be competing in our 4th Battle of the Apps Contest, held on Wednesday 19th June, 2013 at Bisous, 9/F, LKF Tower, 33 Wyndham Street, Central, Hong Kong. We list them below in order of submission to the contest and provide links to their websites, apps and social media presences. Do try them out and let us know what you think. Yoketown: a social city guide with quality content. Download from iTunes. Follow on Twitter (@yoke_town) or Facebook. Little Rewards: an incentive programme for reluctant children that teaches goal setting and the value of rewards, including money. Download from iTunes. Follow on Twitter (@littlerewards) and Facebook. ZNAP, by MPayMe: a new way to simplify payments. Download from iTunes, Google Play or BlackBerry App World. Follow on Facebook and watch on YouTube. Search for Amazon, by S4BB: search for and set push notifications about sales on Amazon.com and Amazon.co.uk. Download from BlackBerry App Store. Follow S4BB on Twitter (@s4bb) and Facebook. ConnectU Map: a social map to end shyness. Download from iTunes. Follow on Twitter (@gteconnectu) and Facebook. Catch those special moments on YouTube. 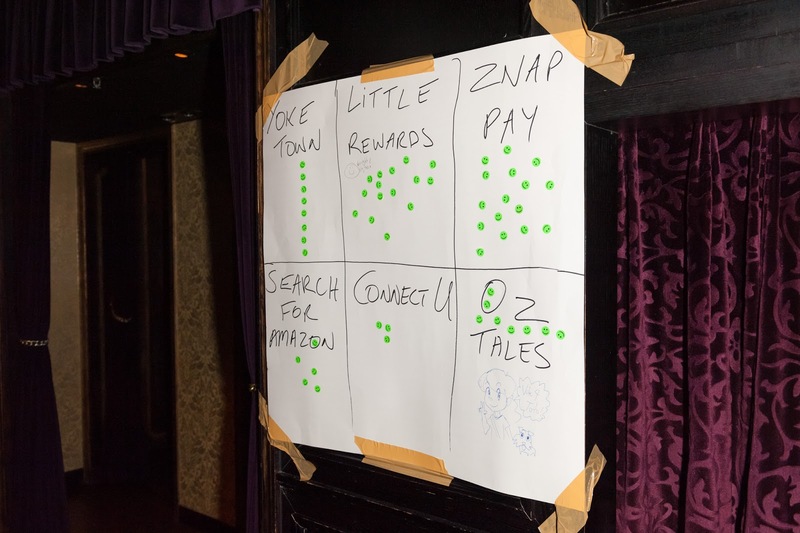 Oz Tales, by FamLoop: a highly interactive story for kids (and parents). Follow FamLoop on Twitter (@famloop), Facebook, Pinterest, Google Plus and watch their video demos on YouTube. HotelQuickly: last minute hotel bookings with deals in the Asia Pacific. Download from iTunes. Follow on Twitter (@hotelquickly), Facebook, Pinterest and Flickr. Pingspot: a fast and easy way to share recommendations of great local businesses, and discover places from people you trust. Download from iTunes. Follow on Twitter (@pingspot) and Facebook. Provesor, from FETC (香港財智科技): brings investment algorithms to the public. Download from iTunes. Follow on Twitter (@ericdiwu), Facebook, Sina Weibo and LinkedIn. (Note the different use of channels). LanguageX, by Global Citizen: a way to find people anywhere at anytime for language exchange. Download from iTunes. Follow on Twitter (@globalcitizenco) and Facebook. GOnnect: a better way to find, make and keep connections. Download from iTunes. Follow on Twitter (@gonnect) and Facebook. 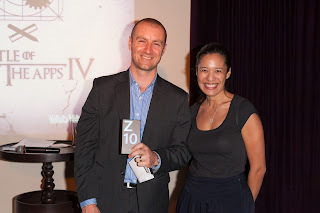 We also have prizes from our generous sponsors, Amazon Web Services, Amaze Mobile Media (a member of the Gravitas Group), BlackBerry Hong Kong and the Internet Society of Hong Kong. 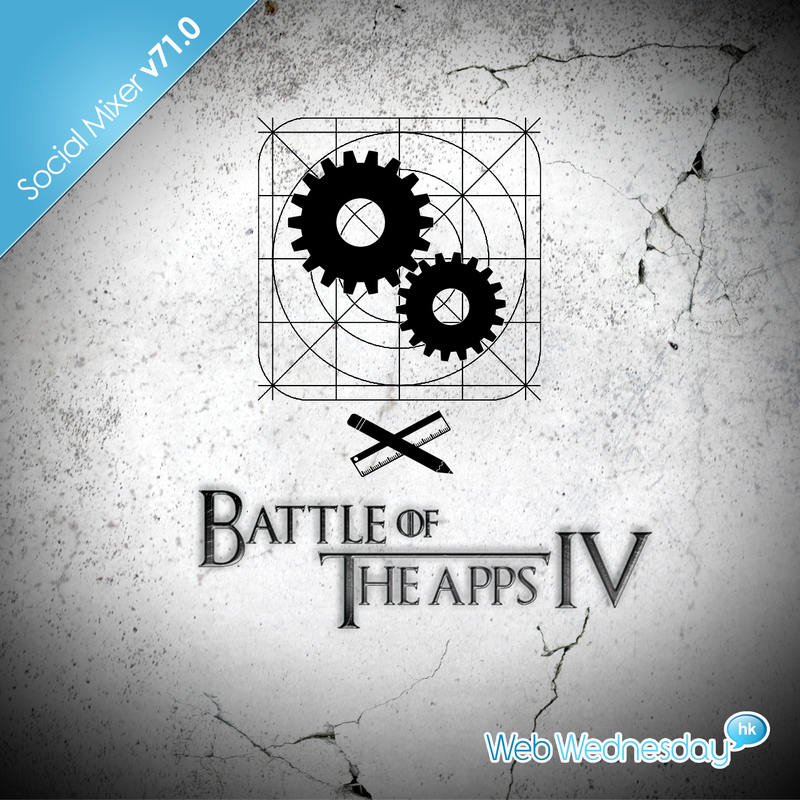 Due to the popularity of our past three contests, we are running our 4th "Battle of the Apps" on 19th June, 2013. The competition is open to application creators, developers and publishers who participate in a live contest in the heart of Hong Kong's Lan Kwai Fong party area. All apps welcome, be it on iOS, Android, Blackberry, Windows, Chrome, Symbian or any other operating system (TV, tablet or smartphone). Networking will start at 6:30pm, with the battle from 7:00pm sharp on 19th June 2013 at Bisous, 9/F, LKF Tower, 33 Wyndham St, Central, Hong Kong. Submit your app via the form below, join the event on Facebook and spread the word on social media using the shortened URL "bit.ly/battleofapps4". Curious to learn more? Read about Battle of the Apps I, Battle of the Apps II, Battle of the Apps III and the winners of BoA III. 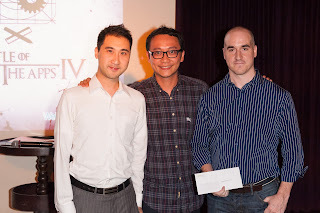 The gold winner, Coach's Clipboard produced by JL Plus, went on to win the Best Asian Smartphone App Contest and has been accepted into Nike+ Accelerator programme. Each contestant will have 5 minutes to show off their creation and will have 2 minutes for questions from the floor. Due to time limitations, there will be a maximum of 10 contestants with prizes for the winners. 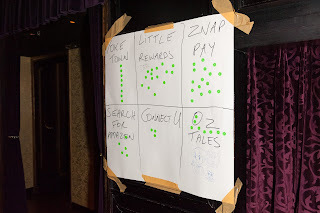 At the end of the evening, the audience will vote with their feet fingers (good, old fashioned, analogue stickers!). The most popular app will win great prizes and a full interview slot at an upcoming Web Wednesday with all the associated promotional benefits. If you're a contestant, sign up to join the fray below. Otherwise, do help me spread the word - using "#battleofapps" and shortened URL "bit.ly/battleofapps4" so that we can attract a wide range of contestants.